This week we read the rest of Mark 13. The sermon is really divided into a macro and a micro part. The consolations are the macro. If you read Mark 13 as a whole there is a great rhythm to the sermons. The horrors seem to increase, but each increase ends with a promise. The point is not to stoke worry or even less rage as so much of the world’s narratives are designed to do. The point is to restore sanity. He’s got the whole world in his hands. He really does sit at the right hand of God. It’s going to be okay. 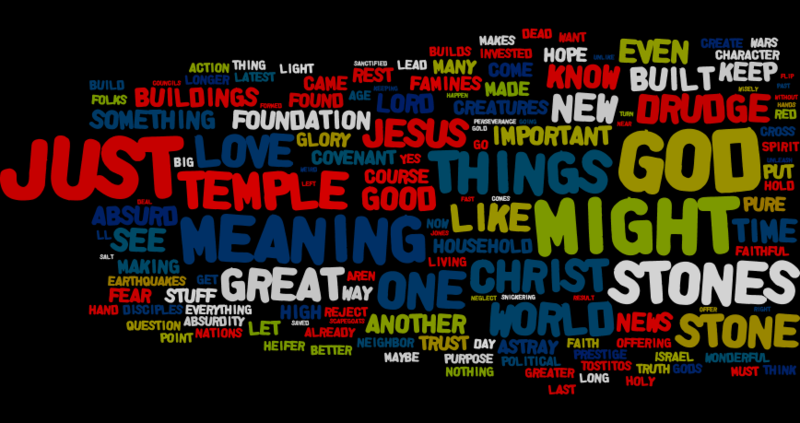 The micro part is when you start focusing on the words and tracing out what they mean in scripture and history. One part of that is listening carefully to Jesus’ time markers. When we listen carefully we can make the distinction between those times by which Jesus means the time around AD 70 and the destruction of the Temple and that day and that hour by which he means the last day. Those times have a specific sequence and will end within this generation. And they did. That day and that hour are unknown. That is necessary to set some ground rules, but the word that this sermon hones in on is abomination or more specifically the abomination of desolation. It is actually a well defined term or concept in the Old Testament and history. We can’t use it to make a timetable; that is foolishness, but we can think about endings of old orders. This sermon lays out that groundwork and does what a watchman does, it cries watch. This is part one of what is variously called the Olivet discourse, the Mark Apocalypse or the end times discourse. The Olivet Discourse is so named because of its location on top of the Mount of Olives opposite the Temple. That is actually the name I prefer because I think the other two get things wrong from the start. There is a way that Mark 13 is about the last days, but it not an easy direct application. Most of Mark 13 I think is talking about the run up to AD 70 and the destruction of the Temple. Jesus condemns the temple, what eventually serves as part of his conviction by the Sanhedrin, and the disciples ask when and what are the signs. Jesus tells them. Within this generation and a fairly detailed amount of signs. But after that, Jesus seems to know that we couldn’t resist attempting to find out the last day, so he says “about that day, no one knows, only the Father.” So Mark 13, for us, is not a step by step countdown. No one knows. But there is a way it is not a dead letter. The temple was about the end of the old order. The temple specifically was about the sacrificial system. After the crucifixion there is no need of sacrifice. The cross of Christ is the only necessary sacrifice. The old order was over and its symbol the temple came down. But not all of the old order was brought to completion. 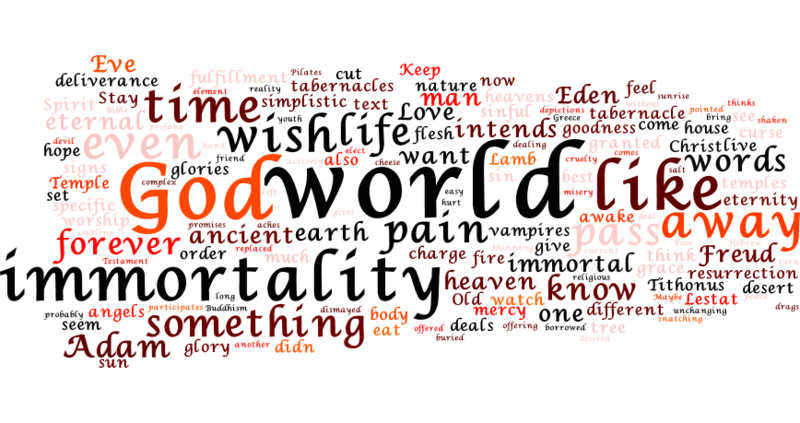 This fallen world chugs along. Jesus doesn’t answer the when question to that, but much of what he says about the signs of the end of the temple also apply to the world. What are the signs? False prophets, political turmoil and persecution. These are the signs of the inbreaking of the Kingdom of God. And what Jesus counsels is a watchful hope. We know we have won, because he won. Jesus lives. All who endure to the end will be saved. That is our sure hope. Watchful because we know this world hates us. It is dying and we have life. We are on our guard lest it manage to steal that hope from us. We live in that tension as witnesses to the hope. Musical Note: I have left in our Hymn of the Day, Rejoice, Rejoice, Believers Lutheran Service Book 515. It is a pretty tune absent the often minor and melancholy of other End Times type hymns. The last couple of stanzas carry the watchful hope that I desired to preach about. The of the start of the fourth stanza: Out Hope and Expectations, O Jesus now appear. So, in part 1 we made two conclusions about Mark 13. First Mark 13:1-31 is talking about AD70 while Mark 13:32-37 is talking about the Last Day. Second, based on Mark 13:14 and specifically the authorial comment, we readers must be meant to get something out of Mark 13:1-31. Even though it is about AD70, it is not a dead letter. The way it is not a dead letter is to read it typologically. First a note about typology, this is how the apostles thought. You can see Paul using it in Rom 5:12-21, Peter in 1 Peter 2:1-10, John in 1 John 3:11-24, and even the unknown author of Hebrews in Heb 3:1-6. There are a bunch of other examples. What I would assert is that this is exactly what Jesus taught them in Luke 24:44. All of scripture talks about Jesus. It is interpreted Christocentrically. At a more basic level what I mean by typology is that a person or event in the past has continuing relevance for the present and future by means of being fulfilled. A typology that Jesus refers to is the sign of Jonah. Jonah is a type of Christ in that his three days in the belly of the whale are fulfilled by Christ’s three days in the tomb. (Luke 11:29-30) If you want to read more about typology the Wikipedia entry isn’t bad. Dr. Stein puts forward Phanni, a high priest appointed by Zealots, as the fulfillment in AD70. The recognizable abomination was that Phanni: a) wasn’t qualified according to the law, b) allowed murder and division in the temple and c) profaned the Holy of Holies. All of that would have been easily recognizable by the common Judean Jew. He was appointed sometime in 67-68, so well before Rome encircled the city. And he is a person and not a thing. I want to pause for a second to reflect on what this excludes. The abomination of desolation is not something in the political realm. Based on the original types we would not look for this in politics. What it really leads to is the end of a religious institution. The temple came down. It is the sign of impending judgment on a religious establishment. 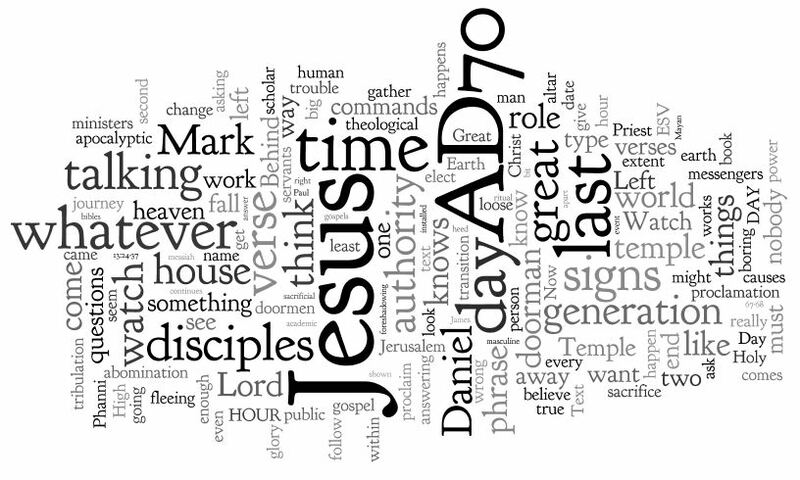 AD70 was a sign of the Lordship of Jesus. A religious establishment that has gone off the rails can be called to repentance, but if you see the abomination of desolation, it is too late, flee. We know from Acts and the letters that the Apostles continued to meet in the temple (Acts 3:1). They called for its repentance (Acts 3:17-19). They knew it would come down because Jesus predicted it, but it was still the center of religious life, and who knows maybe God would be merciful, until the abomination. When you see that, flee. So, here is what I would say is the payoff. Looking at AD70 as a type, we might see its fulfillment among ourselves in divine judgment upon church bodies that are irredeemable. 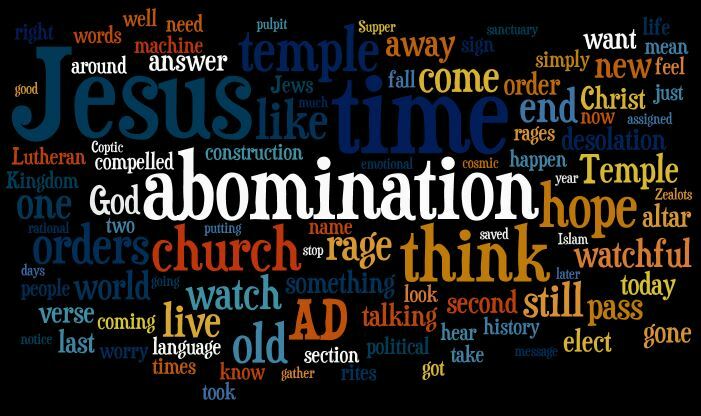 If you see a church body that has profaned the sacraments and altars what you are seeing is an abomination of desolation. If you see such a thing, that is the time to flee. The time for calls to repentance are over. The faithful can see that fall as proof of the Lordship of Jesus Christ. Jesus is the head of the church and he will not be mocked. None of this calls for or expects a perfect church. There is a lot of ruin in a church before you get to abomination. The final jump is yours, let the reader understand. Do you see an abomination? If there is one, this generation will not pass away before the fall happens. I would be pretty sure that something like this might qualify. Altar and Ritual, check. Recognizable, should be. Early enough, yep. People instead of things, yep. Please note that I’m talking about the church here. I have made no comment about the political or even the social realm. The abomination of desolation and any judgment is reserved for religious institutions. I also want to re-iterate again that this is something extreme. I don’t think this happens “all the time”. Really what this amounts to is a final warning to any believers remaining in these church bodies. If all the calls to repent have been rebuffed and the institution is “damn the torpedoes, full speed ahead” into flagrant heresy then you might see this as the final sign, flee. Three problems with the what the Bible actually has to say about the end times. 1) It’s real message is incredibly boring. One word. Watch. About that day and hour, nobody knows. No elaborate timelines. No warnings or signs. 2) So much of it is given to us in a language that we just don’t understand anymore. It is not that we can’t understand it. It is just that it takes either a bunch of time cross referencing Old and New Testaments and looking up apocryphal literature of the time and when you do that you get a sense of time wasted because it is boring. (I did all that and I don’t have a date or at least a Mayan calendar?!? 3) Much of it happens to refer to a historical which requires us to know history. 3a) Ok, one more. There is a deep hermeneutic question that is just really unanswerable and really is something that just can’t be brought into the pulpit. If you want to discuss the hermeneutic question, come to bible study next week. (We started it this week and will continue next week). That question to me is to what extent can AD70 and the parts of Mark 13 that talk about it be treated in a typological way. Not typological to THE LAST DAY as that is ruled out by the text, we don’t know, but typological to churches or an End of An Age. My question in study started with what would a modern abomination that causes desolation look like. I think there are some modern parallels that don’t point to an easy future if read typologically. But, that is not pulpit type stuff because it is ultimately just refined speculation. It does lead back though to what I did take into the pulpit – watch, be on your guard, wake up, lest when He comes suddenly, He finds you asleep. Now is the time of grace. Fill your lamps. Eschatology or Last Things circles back around to first things, the alpha meets the omega. And right at the base if first things is identity – who or what do you see yourself as? Do you emerge from a random universe, a brief flowering of dust that will go back to dust having done nothing other than move some dust around? Are you unknowing about such things, better to eat, drink and be merry. Or are you the special creation of a personal God who knew you before you were formed? Who you think you are will have a big influence on where you think you are going. But being sinful creatures, even if we mentally have our first things in line with truth, we are often drawn to temporal replacements for that identity – the temples of this world. They are big and impressive and often cohesive and can be good, but not even the temples are a first thing. If they obscure our identity as a Child of God, its got to go. We so easily latch on to created things to build our identity. Jesus’ warnings, and the roiling turmoil of the birth pains, are reminders to watch. To remember whose we are. And to remember whose promises we can trust. The struggles of the last things are a sharing in the sufferings of Christ – The First Thing. God did not choose works or any other means to save us, but he chose faith. A faith that the cross is actually the victory. That a death is actually the life. That God can be found in the depths just as surely as the heights. That God has shared everything that is common to man. Last Things are not so much a peering into the future, but an appeal to faith that the glory of God is concealed, is held, in the present tribulations. That God has not abandoned us, even when we walk through the valley of the shadow of death. For we hold this eternal treasure in jars of clay.